Flowers make an elegant decoration, and they're even better if you can eat them, so it's worthwhile to teach yourself how to make icing roses for a cake. If making roses seems like a skill that's better suited to a professional cake decorator, relax. All you need to make them yourself are a few basic pastry supplies and some time to practice. You can make roses out of fondant, gum paste, marzipan, royal icing, or buttercream. The method for each type of icing is a bit different. To make a rose, you need to prepare a pastry bag and create a center for the flower, then pipe on petals from the inside out. 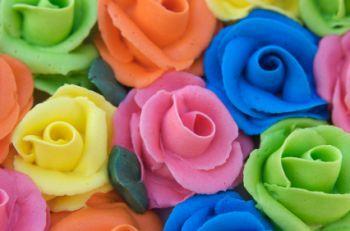 Mix up some buttercream frosting and tint it with gel coloring, if necessary, to achieve the color you'd like for roses. 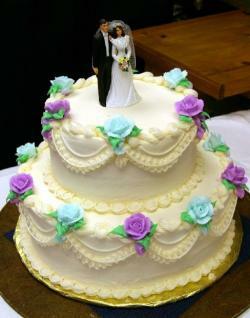 Make sure the buttercream has a stiff consistency so it won't droop or melt after you pipe it. Push the coupler down into the pastry bag until it pokes out the open end. Place the rose tip over the end of the coupler on the outside of the bag. Screw the coupler closed so the tip is secure. Fold two or three inches of the bag's top to the outside. Hold the bag in your non-dominant hand and scoop in frosting with your other hand by using the flat spatula. Squeeze the frosting to the bottom of the pastry bag, and twist the top of the bag once or twice to keep frosting inside the bag while piping. Start with the wide end of the rose tip just touching the center of the flower nail. While rotating the flower nail with your left hand, move the rose tip with your right hand and pipe frosting consistently but not too quickly. Stop when you have created the shape of an upside-down cone. Move the frosting tip up a bit and create another cone on top of the first, using the same motions. You can make the rose center as high as you'd like depending on how big you want your rose. If the center is high, the finished rose will be large. Pipe rose petals in a gentle up-and-down motion, overlapping each petal at the halfway point. Begin near the bottom of the rose center. Squeeze the pastry bag gently to release a small amount of frosting. Pipe up, then down. Don't let the petal go more than a third of the way around the center. Starting at the halfway point behind the first petal, pipe another petal. Continue this pattern until your first layer of petals is complete. Pipe a second layer of petals on the outside of the first layer. You'll need more petals on the second layer. With each layer you add, increase the number of petals. Finish when your rose is as full as you would like it. Once you've learned how to make icing roses for a cake, you'll need to transfer them off the flower nail and onto the iced cake. To transfer your finished rose, quickly run a knife or a slightly opened pair of scissors on the bottom of the rose to pick it up off the flower nail. Set the rose down on top of your cake or cupcake. If you have trouble removing it, use another knife to gently brush it off and set it in position. After you've positioned the rose, you can use leaf pastry tips to add surrounding leaves, if you'd like.